First of all, what is Sherpa? Generally, Sherpa on the market refers to 100% polyester, or a blend of polyester and acrylic, or cashmere wool blended with synthetic fibers. Although Sherpa is also a very warm fabric, it is not equal to wool. It is a kind of heavyweight fabric with a fluffy feel. Compared with pure wool fabrics, Sherpa fabric is cheaper but still has many benefits. Sherpa looks elegant and refreshing, with good drape and breathability. Sherpa clothing will make people have a strong sense of warmth and comfort. It has a soft texture, touches smooth and delicate, and is full of elasticity. Sherpa fabric has good physical properties because of the high fiber strength. It is wearable. The chemical properties of Sherpa are also very good. It is not only resistant to alkali and some other chemicals, but also anti-mold and insect-resistant. It is not easy to deform and wrinkle after being treated by high-temperature shrinkage. Due to these benefits, Sherpa is often used as lining fabrics and winter accessories. For example, you can use Sherpa as lining fabrics of jeans jackets. That looks cool. And meanwhile, it is warm to wear in early winter. Different colors can exhibit a special style. A hat made of Sherpa is very soft and comfortable. What’s more important, it can well protect your head and ears in cold and windy days. Adding a layer of Sherpa fabric to winter boots will keep you feel warm in winter. It is not as bloated as snow boots, but it is more resistant to coldness than ordinary boots. 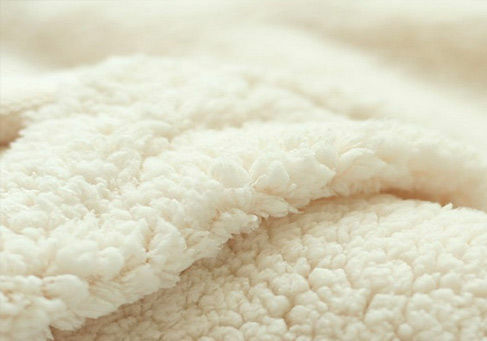 In addition, Sherpa fabric is also suitable for home textiles, such as blankets, cushion, and etc. If you want to clean it at home, be sure to take a look at the precautions on the tag of the Sherpa product. In general, when washing, it is best to use a neutral water at about 20-30 degrees Celsius, and use special detergents for fleece products. Avoid using enzyme detergent to prevent the Sherpa from being eroded. Then, gently pat and rinse with water. After that, it can be dehydrated in a washing machine. Sherpa is a natural warm product. It is comfortable to wear, and cleaning is not complicated. In a word, Sherpa fabric is a good choice for our warm wear. As a wool fabric manufacturer, UNITEX provides Sherpa fabrics with different colors and composition at best quality and competitive price. This entry was posted in blog and tagged Sherpa.